Sneaking contraband into prisons has always been a problem for jailers and inmates alike. In the Johnny Cash diddy, “I’ve Got Stripes,” Cash sings about his mother coming to see him in prison on a Monday only to be caught with a file on a Tuesday. But since that song was released in 1959, not only has the coveted contraband changed, but also the methods of delivery. As Kerri Jo Hickman understands, modern problems require modern solutions. Kerri Jo Hickman didn’t cut corners while crafting her care packages. Cellphones, chargers, ear buds and digital scales, were all crammed tight into plastic bottles. They contained tobacco, methamphetamine and marijuana, too. Officials say she was ready to deliver the goods on March 10 and drove the items to the North Fork Correction Center in Sayre, Okla., more than 120 miles west of Oklahoma City. Aiming a T-shirt cannon from the window of her vehicle, Hickman fired one of the contraband-filled bottles over the prison fence, Matt Elliot, spokesman for the Oklahoma Department of Corrections, told The Washington Post. The aerial drop-off was immediately noticed by prison staff, who reportedly saw the package “fly out of the vehicle” and onto prison grounds, where it landed near a housing unit. I wonder what type of T-shirt cannon she used? 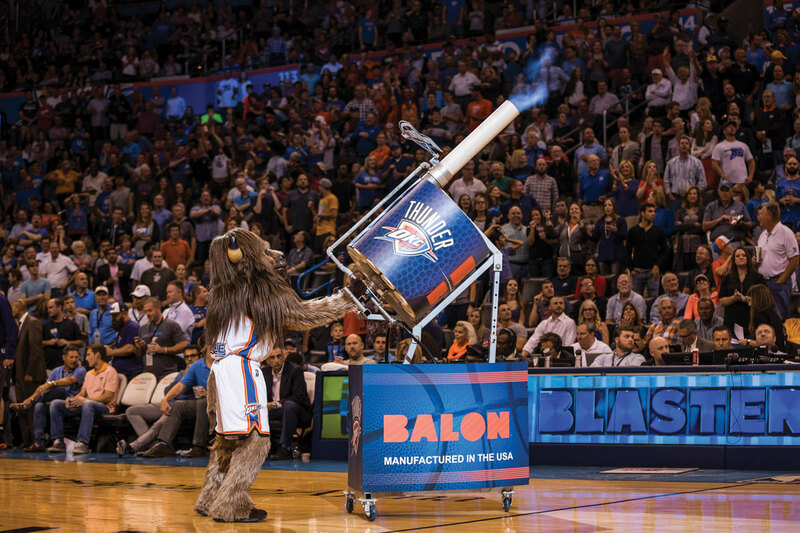 Was it a simple handheld device like Spencer used that day he operated the canon for Energy FC, or a fully-automatic Balon Blaster like Rumble used in the Peak? 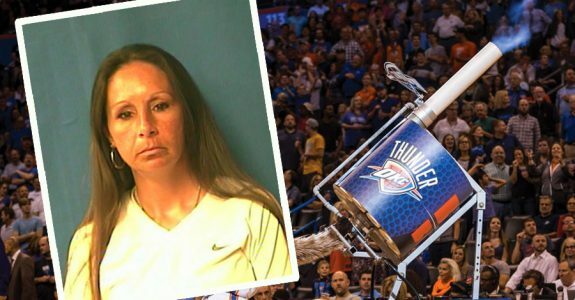 The article goes on to describe how Kerri Jo high-tailed it onto I-40, where she was pulled over by OHP, caught with the T-shirt cannon, and arrested on the spot. As someone who has successfully escaped Western Oklahoma, I’m here to tell you that a little more planning is needed if you’re going to make a clean get away. Kerri Jo not only shot her cannon in broad daylight and in full view of the prison staff, uut she also neglected to ditch her t-shirt cannon before hitting the road. I think I put more planning and effort into making it out of Beckham County without being dragged to church by my parents on a weekend visit than Kerri Jo did to try to escape without being dragged to jail. Elliot said he’s seen people use all sorts of methods to sneak contraband into prisons, but Hickman’s alleged use of a T-shirt cannon was unusual. He called the smuggling of illicit items into correctional facilities a “sinister” problem that can perpetuate prison fights and lead to corruption among staff members. Cellphones are particularly problematic as they are often used by prisoners to orchestrate future drops. The method allegedly used by Hickman, he added, was a “novel approach to a bad idea. This “novel approach” led Kerri Jo to be charged with drug trafficking, smuggling contraband, and conspiracy and booked into the Beckham County Jail. Which goes to show that something innovative isn’t always effective. Now, Johnny Cash wrote many ballads that empathized with the plight of the imprisoned. But I think even Cash would have a hard time understanding what in the hell she was thinking. The Beckham County Jail is haunted. Believe me, I know a guy. Follow Hayley on twitter @squirrellygeek. How does so much contraband make it into prisons? It’s surely not by way of T-shirt cannon or drone drop – at least not very often. It’s most likely by way of corrupt (and woefully underpaid) prison staff. What else could it be? If this scheme had been allowed to go unpunished, it might have cut prison staff out of a major source of much-needed supplemental income. No surprise that the incident was reported and the perp arrested in the blink of an eye. If we built a large wooden badger…. +1. Was that before or after the wooden rabbit got catapulted back at them? Haven’t these prisons heard of cell phone jammers? If the administrators need to use the phone they can use a landline…there,one problem solved. No, no, no. She wanted to be arrested and jailed. Part of her plan to personally smuggle in contraband. Maybe the part about cavity searches eludes/eluded her.